If you are a flu shot avoider, like I am, you probably aren’t crazy about the drug store flu remedies. Here’s a flu survival guide loaded with natural strategies and kitchen remedies in case one or more of your family members gets sick. Despite your best efforts at prevention, sometimes the flu just happens. If you work with the public or have children in school – or heck, even go to the store from time to time – you and your family will be exposed. Sometimes those viruses are simply tougher than your immune system. The flu is going wild right now and is widespread in 36 states, according to a report by the CDC. The current strain is H3N2. Here’s an arsenal of strategies if someone gets sick. If you must touch items that the sick person has used, immediately wash your hands afterward. I generally avoid the pharmaceutical solutions because I choose not to use them. 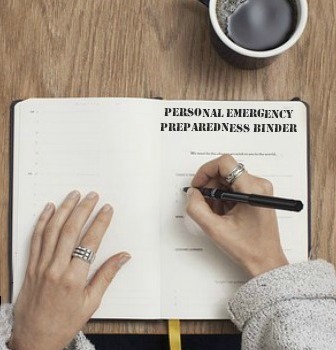 One day, we could be in a situation where relief is no longer available a few minutes away at our local pharmacies or department store. It’s important to learn now how to relieve unpleasant symptoms using simple home methods. 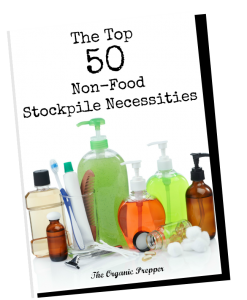 This will help you to select the most useful items for your stockpile while allowing you to become more comfortable with using natural solutions. We always stock everything we might need to fight off a bout of illness, whether it’s the flu, the common cold, or some other type of sickness. We keep on hand chicken or turkey soup (home-canned is the most nutritious), rice and pasta, tea, honey, juice, elderberry extract, and ginger-ale. These provide both comfort and essential nutrients to help family members recover more quickly, and if the adults happen to be sick, no one has to venture out when they feel terrible in order to buy the necessary items. Aside from that, we keep a well-stocked cabinet of home remedies. Forget heading to the petri dish that is your local pharmacy and don’t worry that you’ll require exotic ingredients gathered in Tibet on the night before the full moon by a left-handed virgin. Many of these items can be found right in your kitchen – there are lots of things you probably already have that help reduce the misery to a tolerable level without the risk of nasty side effects! Recent research has shown some very significant results with the use of elderberry when treating the flu. For anyone concerned about the possibility of a serious pandemic in the future, elderberry is a vital addition to your home pharmacy. The only elderberry extract that is tested and scientifically endorsed is Sambucol Original, which you can get here. Green tea is the perfect beverage for someone suffering from the flu. A cup of green tea that has been steeped for 3-5 minutes is loaded with immunity-boosting antioxidants. You want your immune system functioning at top performance your cells to fight off the germs which are making you sick. Mint tea is the classic herbal tea. Mint is an ingredient in many different commercial tea blends and is much-loved for its refreshing fragrance. There are all different kinds of mint tea available. The most common are peppermint, spearmint and wintergreen. They all contain menthol, a volatile oil. Menthol is the component that gives mint that “cooling” sensation. Mint tea is anti-spasmodic and has muscle relaxant properties that can help reduce vomiting. Mint tea is very multipurpose. If you don’t eat meat, you can make a powerful veggie-laden broth from garlic, onion, carrots, ginger, and hot peppers. Yogurt can’t be tolerated in all episodes of stomach and intestinal upsets. However, yogurt with active cultures is said to rebalance the “good flora” in your stomach and intestinal tract, making it especially valuable for treating diarrhea. Regular consumption of yogurt can actually prevent stomach viruses in the first place by making your digestive tract inhospitable to viruses. If you have an essential oil diffuser, try eucalyptus oil to help open up congested airways. If you don’t have a diffuser, add a few drops into a steamy bathtub. Some people say this also helps to relieve a bad cough. Ginger tea can be taken twice per day if you have flu symptoms such as headache, sore throat, congestion, and chills. Make the tea by steeping 2 tbsp of fresh ginger in a cup of hot water. It’s not recommended to exceed 4 grams of ginger per day – components in the herb can cause irritation of the mouth, heartburn, and diarrhea if taken in excess. Several companies offer a ginger tablet remedy. However, if you go over to the vitamin section, quite frequently you can find Ginger Root. Buying it from the vitamin section, without the glossy anti-nausea advertising, can save you a hefty amount. I checked at my local pharmacy today and 90 Ginger Root capsules (500 mg) were the same price as the bottle of 20 “All-Natural Ginger” anti-nausea tablets. Both were $8.99. As well, the one in the supplement section had no additional ingredients aside from the gelatin capsule that encased the powder. Ginger pills are about $7 on Amazon, which is where I now get mine. You can also get a 3-pack of organic ginger pills for $30.